session to release tight or traumatized muscle tissue. 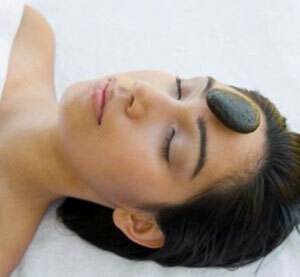 When tissues are tight... hot stones are applied. 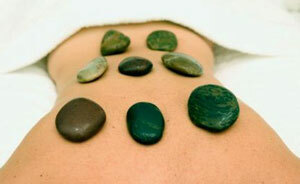 Conversely, when traumatized and inflamed tissue is present... cold stones are applied-in some cases, both are utilized. Stone therapy is always used in conjunction with either Chinese Relaxation, Tuī Na or Chinese Deep Tissue therapy for the greatest results to be achieved. Some of the health conditions treated with Stone Massage are... arthritis, stress, anxiety, circulatory problems, severe migraine and cluster headaches, MS, back pain, fibromyalgia and general muscle tissue discomfort caused from over exertion or sports injury. At Wendy's Massage... there is a massage type and technique offered that will meet everyone's individual needs-from a pampering Chinese Relaxation massage to Caī Bei and Hot Stone therapy. As Wendy cannot perform every type of massage for her customers... she has teamed up with other World Class Therapists who operate their own business and offer their special skills and techniques, so that the widest variety of massages can be offered for your pleasure. 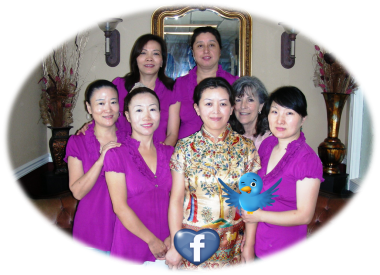 Wendy is very proud that each of them have chosen to provide their unique skills here in Chico... and are collaborating and sharing our beautiful massage facilities.